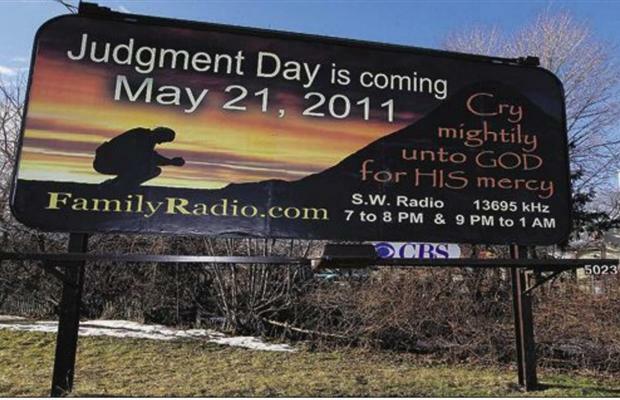 Rapture, Judgment Day, Billboards: Oh my. Historiann posted on the historical legacy of end of the worlders last week, and I couldn’t resist reflecting on this topic over at Religion in American History because the mainstream news media are discussing the ins and outs of the Rapture. How did that happen? Why are we so concerned? The concern makes sense if you follow Tim LaHaye’s logic that first responders, pilots, nurses, and doctors will all be the first to be raptured. If you don’t, then what is the appeal of the Rapture? Why is the coverage mostly on the Rapture and not on the proclaimed Judgment Day? Perhaps, the Rapture has become coded as the sign of the end with littered clothing, abandoned cars, and forlorn pets. Though I would also like to say that considering the number of articles written about the current doomsday prophet du jour entitled “Apocalypse Now,” I would never consider that the working title for my project on American apocalypticism. It is clever once, but twenty or so times later, not so much. The beauty of millennialism is not in its rigidity but its malleability and adaptability. Camping fits securely into a long line of doomsday prophets, millennial visionaries, and according to the less gracious, religious hucksters who prey on people’s fears, money, and naiveté. Huckster or not, I don’t really care. Rather, I do care about what Camping’s media-frenzied stint says about the pervasiveness of millennial fervor in North America and the popularity of the vengeful fantasies of judgment that inundate apocalyptic belief, practice, and products. As someone with an ongoing scholarly obsession with the apocalypse, consumption, and materiality, I am surely following my bliss this week with each mention, web click, Facebook status update, and journalistic attempt to understand the appeal of Camping and his billboard/caravan campaigns. The coverage of the impending Rapture runs the gamut of pet care services for the dogs, cats, and iguanas of the Raptured to Richard Dawkins’ grumpy commentary about said press coverage to Killing the Buddha’s Apocalypse Week 2011 to Salon’s explanation of Camping’s mathematical equations and dating of the end. The coverage ranges from somewhat sympathetic to downright hostile. Some admirably tie Camping a larger history of millennialism in North America, while others declare him a false prophet outright. In August, I have an article coming out on rapture readiness (seems a little late considering the climate now), in which I document two other sources of Rapture information and practice, the prophecy work of Tim LaHaye and RaptureReady.com to document how the Rapture emerges as not only rhetorical and absent but also material and present. Continue reading here. University Press o f Kansas now has an official website for Gospel According to the Klan, which will be available in September. To many Americans, modern marches by the Ku Klux Klan may seem like a throwback to the past or posturing by bigoted hatemongers. To Kelly Baker, they are a reminder of how deeply the Klan is rooted in American mainstream Protestant culture. Most studies of the KKK dismiss it as an organization of racists attempting to intimidate minorities and argue that the Klan used religion only as a rhetorical device. Baker contends instead that the KKK based its justifications for hatred on a particular brand of Protestantism that resonated with mainstream Americans, one that employed burning crosses and robes to explicitly exclude Jews and Catholics. To show how the Klan used religion to further its agenda of hate while appealing to everyday Americans, Kelly Baker takes readers back to its “second incarnation” in the 1920s. During that decade, the revived Klan hired a public relations firm that suggested it could reach a wider audience by presenting itself as a “fraternal Protestant organization that championed white supremacy as opposed to marauders of the night.” That campaign was so successful that the Klan established chapters in all forty-eight states. Baker has scoured official newspapers and magazines issued by the Klan during that era to reveal the inner workings of the order and show how its leadership manipulated religion, nationalism, gender, and race. Through these publications we see a Klan trying to adapt its hate-based positions with the changing times in order to expand its base by reaching beyond a narrowly defined white male Protestant America. The book is now available for pre-order via Amazon, which has to be coolest thing I’ve ever seen. 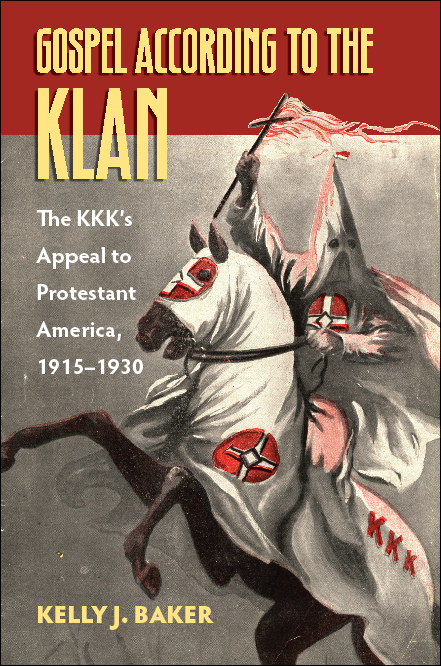 Just a quick note to say my forthcoming book now titled, Gospel According to the Klan: The KKK’s Appeal to Protestant America, 1915-1930, now has a cover! The book will be available in August, and I’ll link to it as soon as it is up. Please check out the lovely design from the equally lovely University Press of Kansas. This nun image is for Amy Koehlinger, though others may enjoy it as well. This is my humble attempt to document those scholars who use gender as a category of analysis in American religious history. The first four on my list were the scholars whose work has most deeply influenced my own. The rest of my list includes scholarship I love as well as scholarship that I need to know (and you do too!). My current goal is to list 31 scholars for the 31 days of NWHM. Let’s see if I can do it! More than thirty years after the rise of women’s history alongside the feminist movement, it is still difficult to ‘find’ women in many books and articles about American religious history…[M]any seem to assume that women’s stories are peripheral to their research topics, whether Puritan theology or church and state. They do not seem hostile to women’s history as much as they are dismissive of it, treating it as a separate topic that they can safely ignore. Since ‘women’s historians’ are devoted to writing women’s history, those who simply identify themselves as ‘American religious historians’ can focus on topics that seem more important to them (1). Brekus makes it clear that American religious history needs to attend to gender and her contributors showcase how studying the lives of women change the tenor, strategies and narration of American religious history. I reread her introductory essay, whenever I need a kick in the pants to do good gender analysis as a method to improve my scholarship. Women’s history is not just the purview of women’s historians. In her account, we see how the efforts of women enabled the church to build schools, provide food and clothing to the poor, and offer a host of social welfare services. And we observe the challenges of black women to patriarchal theology. Class, race, and gender dynamics continually interact in Higginbotham’s nuanced history. 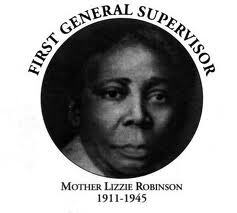 She depicts the cooperation, tension, and negotiation that characterized the relationship between men and women church leaders as well as the interaction of southern black and northern white women’s groups. Righteous Discontent finally assigns women their rightful place in the story of political and social activism in the black church. It is central to an understanding of African American social and cultural life and a critical chapter in the history of religion in America. 7. Amy Koehlinger, a contributor to The Religious History of American Women, the author of The New Nuns: Racial Justice and Religious Reform in the 1960s (2007), and one of my mentors, helped me wrestle with Judith Butler’s Gender Trouble as well as informed my approach to 1920s Klan femininity and masculinity. Amy’s work on Catholic nuns and their struggles in the Civil Rights movement analyzes race and gender in tandem and demonstrates how nuns negotiated their new roles during the advent of Vatican II. Her new project, titled Rosaries and Rope Burns, explores importance of boxing for Catholic men as well as examines how the sport influenced performances of masculinity. This isn’t first time she’s tackled masculinity. Her essay, “Let Us Live for Those Who Love Us’: Faith, Family, and the Contours of Manhood among the Knights of Columbus in Late Nineteenth-Century Connecticut” in the Journal of Social History, takes to task Mark Carnes’s work on fraternities in the Victorian era for focusing solely on Protestant men’s attempts to move away from domesticity. The Knights of Columbus, on the other hand, imagined their fraternal work as an extension of their family life. 8. Kathleen Sprows Cummings is the associate director of the Cushwa Center for the Study of American Catholicism, author of New Women of the Old Faith: Gender and American Catholicism in the Progressive Era (2009), and contributor to The Religious History of American Women. Kathy also blogs at with outr much beloved crew at Religion in American History. Her work employs case studies of Catholic women to demonstrate how debates over Catholic identity during the Progressive era were also negotiations of gender roles. She has written deftly about the place of women religious in Catholic infrastructure. Moreover, fashionable dress might present a gender-confused body. For members, “the Spirit could not move into a body that was ‘confused’ about its gender identity,” which meant that women policed the clothing of other women to guarantee one could become sanctified (79). Additionally, dress was the preferred method of controlling men’s sexual behavior. By dressing modestly, COGIC women differentiated themselves from prostitutes and appeared “respectable” (80-81). For Butler, dress is also the signal for changes within the denomination. Restrictions of dress emphasized the importance of self-sanctification, and the embrace of more fashionable attire signaled the engagement of church mothers with the larger world. 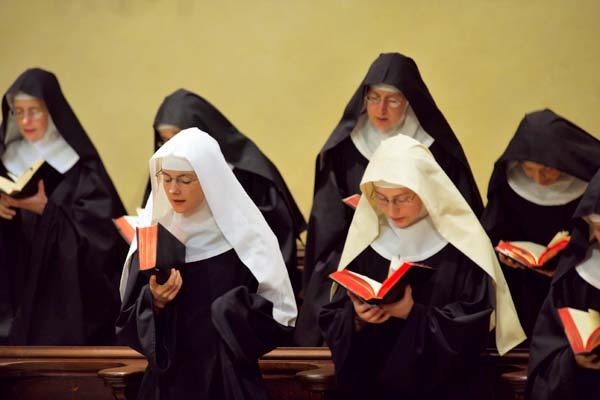 To become civically engaged, these women had to retire plain dress and be “a smartly dressed, well-coiffed and well versed church mother with a vocabulary steeped in scripture yet attuned to the social realities on earth, rather than heaven” (136). The evolution of the Women’s Department from 1911 to the 1960s could be traced sartorially. Their dress signaled their spiritual concerns, and their clothing shifted from a material artifact representing inner purity to smart clothing that symbolized a concern with the larger world. For Butler, by the 1970s, clothing had been stripped of much of its religious meaning, and well-dressed women were no longer engaged, but submissive to the commands of male leadership. Her careful attention to the sartorial and the complexity of gender performance for COGIC women makes this one of my beloved examples of Pamela Klassen’s assertion that the history of religion is a history of clothing. 10. 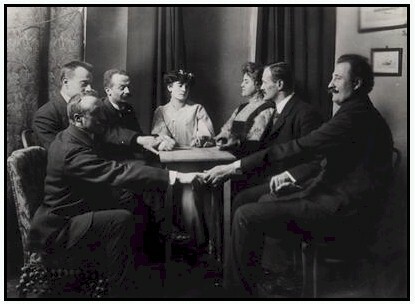 Bret Carroll‘s article on the mediumship of John Shoebridge Williams is one my favorite academic articles, which is not a title I pass around lightly. Carroll uses the diaries of Williams to show how the medium faced conflicting norms of masculinity in Spiritualism but also larger 19th century American culture. Williams had a peculiar dilemma, in that he believed he was growing breasts because his daughter, Eliza, possessed him. I recently taught this article in my gender seminar, and my students were a bit flabbergasted. Yet, the complexity of masculinity, femininity and the problem of androgyny appear in this well-written and humorous article about one male medium’s struggle with his gender performance. Feel free to rush to JSTOR for your reading pleasure. Note: The University of North Carolina press is not influencing my choices with any monetary gains. They just rock when it comes to gender scholarship in American religious history. Spiritualists looking properly detached from this world. As mentioned in my post last week, I want to highlight the scholars who take gender and women seriously in American Religious History for National Women’s History Month. Below, I have provided my first four scholars, and these are the folks that I find most pivotal when I think about the power of gender history to inform and change American religious history. As one might tell, I have favorite pieces of scholarship from each, and each has a large body of scholarship to draw from. The ones I highlight are the ones that influence me most deeply as a scholar. 1. Ann Braude, of course, is at the top of my list. Her works include Radical Spirits: Spiritualism and Women’s Rights in Nineteenth-century America (2001), Sisters and Saints: Women and Religion in America and several edited collections, notably Transforming the Faiths of Our Fathers: The Women Who Changed American Religion. Her essay, “Women’s History is American Religious History” (1997) is required reading. In this piece, she argues that women’s history is central to the narratives of American religions, and that common descriptors like secularization refer to men’s roles and decreasing presence in churches rather than abandonment wholesale of Christianity. For Braude, religious history looks different from the perspective of women, and this needs to be accounted for in our tellings and retellings of American religious history. Again, I wonder how many have taken seriously her call of the gendered nature of our categories of American religious historiography. 2. Pamela Klassen‘s work on religion and maternity is one of my currently most assigned pieces in my gender classes. While I don’t assign the whole of Blessed Events: Religion and Home Birth in America (2001), I do assign her “Sacred Maternities and Post-Biomedical Bodies” from Signs. Klassen’s analysis of home birth tackles one of the most problematic areas for feminist theory, pregnancy. Her article presents the ways in which home birthing women describe their bodies and what is “natural” as well as what is supernatural about birth. Her explorations of what is at stake in the natural clearly shows how pregnancy is socially constructed and biological. Just because we assume biology doesn’t mean it is. 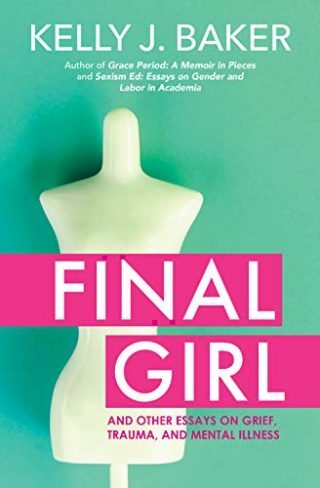 Klassen deftly showcases how the biological becomes paramount in the case of pregnancy, but home birthing women graft social and religious meaning on their bodies as well. They might be “postbiomedical bodies” but they are social bodies as well. 3. Marie Griffith‘s work on Women’s Aglow also appears quite frequently in my classes in American religious history and gender. Much like with Klassen, I don’t assign the whole of God’s Daughters:Evangelical Women and the Power of Submission (1997). Instead, my students read “Submissive Wives, Wounded Daughters, and Female Soldiers…” from David Hall’s edited collection, Lived Religion in America. This haunting piece on the power of submission to God in the lives of women often troubles my students. That discomfort allows for good analysis and equally compelling discussion. I am also deeply in love with Born Again Bodies (2004), which emphasizes the importance/significance of bodies and food in American religious history. Griffith’s assertion of the danger of slimness in religious circles to emphasize certain white, female bodies and the corruptedness of differing bodies stayed with me long after I finished this work. The centrality of bodies to theology also made me rethink my own approach to white, male bodies in my own work. Griffith has just been named the director of the John C. Danforth Center on Religion & Politics at Washington University in St. Louis. 4. Robert Orsi‘s “ ‘He Keeps Me Going’: Women’s Devotion to Saint Jude Thaddeus…” in Religion in American History: A Reader is another constant in my classes. This article is a portion of Thank You, St. Jude: Women’s Devotion to the Patron Saint of Hopeless Causes (1999), which is my favorite book, hands down, by Orsi. Every time I read this article, I find some new layer of complexity from the lovely interweaving of immigrant history, the Catholic Church’s position on women in newsletters, and the material relationships of the women to St. Jude. He writes, “Women…created and imagined themselves, manipulating and altering the available grammar of gender” (349). Moreover, Orsi poignantly notes, “Women believed that they became agents in a new way with Jude’s help” (349). Women believed in agency, but Orsi seems less convinced. This line proved particularly fruitful to my students this semester as they struggled with the question of agency and the desire to see agency even if there is none. Belief in agency startled them and me, and we wondered how St. Jude operates. We pondered what does the attachment to the patron saint of lost causes really mean for women, for Catholicism, and for our class. 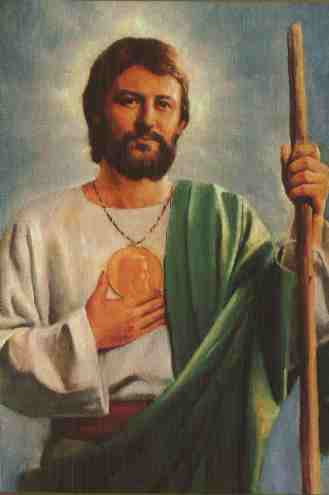 A fittingly handsome St. Jude with kind eyes. Stay tuned for the next parts! Now, cross posted at Religion in American history.